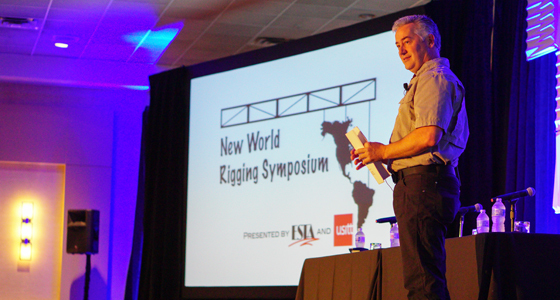 Register now for the second New World Rigging Symposium, produced by ESTA and USITT, taking place March 19-20, 2019, in conjunction with the USITT Conference & Stage Expo in Louisville, Ky. Don’t miss this unique gathering of professional riggers, engineers, venue managers, health and safety professionals, educators, manufacturers, and more — all coming together to learn, discuss, and debate rigging technology and practice as well as safety and workplace issues. The Symposium will provide 10 ETCP education renewal credits for re-certification. The Symposium kicks off with a keynote speech by Rocky Paulson, one of the most highly respected production riggers in the industry and the founder of Stage Rigging, Inc. Rocky helped to establish many of the standard practices of arena rigging that are still used today by riggers worldwide. He is renowned as a teacher and author and has been instrumental in the creation of rigging standards and the ETCP Arena Rigging Certification. In response to strong demand from last year’s attendees for more time on engineering-related topics, two sessions are planned: Entertainment Engineering: How to Get Everyone on the Same Page, and Engineering for Success: Why Things Don’t Fall Down. Additional technically focused sessions include Automation in a Theatrical Environment, Measuring the Uncertainties: Understanding and Working with Load Cells, and a case study presented by professionals from TAIT and Rock Lititz. Safety-oriented sessions cover identifying fall hazards in the work environment and creating risk assessments. Two sessions address topics that are gaining increasing attention not only in our industry but across society in general. Creating a Professional Work Environment addresses issues of diversity and gender discrimination while Mental Health in the Entertainment Work Environment features Dr. John Draper, the Executive Director of the National Suicide Prevention Lifeline, in conversation with Eddie Raymond about how to recognize the danger signs of depression and chemical dependency and where to find resources to help. Registration for the two-day Symposium — including lunches, reception, and a USITT Stage Expo floor pass — is $375. Register for both the Symposium and the full USITT Conference for just $675. See the full line-up of sessions and register here. Thank you to our sponsors for making the New World Rigging Symposium possible: Stage Rigging (Platinum); ETC and J.R. Clancy (Gold); Geiger Engineers, Kish Rigging, and Prolyte Group (Silver); CM-ET, H&H Specialties, The Light Source, Motion Labs, Reed Rigging, Sapsis Rigging, Stagemaker, and Texas Scenic Company (Bronze), Brent Armstrong (Individual); and PSAV (AV). One Silver Sponsorship opportunity is still available.